Impatien buds are snapped off and gone. What could be eating them? I live in an upstairs apartment and they are on the balcony. No sign of slugs anywhere. Could it be birds? My guess is a 4 legged critter has found your salad bar. Mice, rats and squirrels are good climbers. If it had been a raccoon or opossum, also good climbers of walls, the devastation may have been worse. 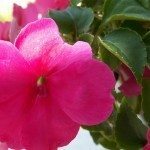 I suggest covering the impatiens at night with garden fabric, also called row cover, or fine netting. Row cover is available online and at larger garden centers and big box stores. A suitable netting material may be obtainable at a fabric store. Of course, you could use a pillowcase or towel but if you forget to remove it in the morning, your plants get no sunlight. This is the time of year when climbing animals look for a place to have their young. If you are lucky, your visitor was just scouting the place and hasn't chosen the attic as a nesting site.